Around autumn, students, teachers, and parents may have some big decisions to make. Private school or public? AP calculus or Art History? What to pack for lunch? Often, the answer to that last question is a bologna sandwich. 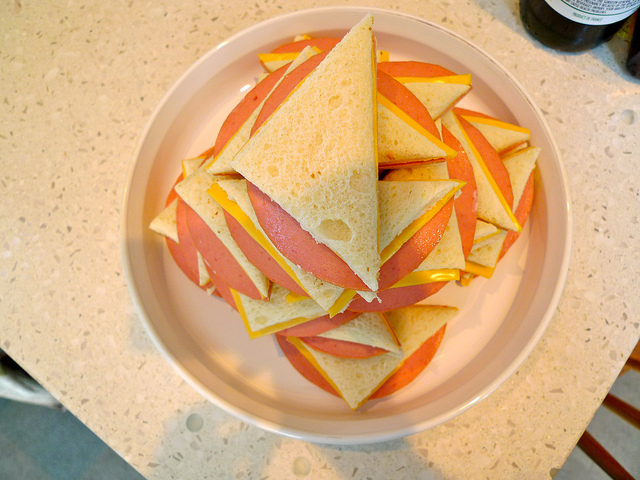 Bologna is the archetypal American sandwich meat – salty, moist, and a bit mysterious. Bologna is a semisolid meat product made from one or more livestock sources, most commonly beef or pork, and may contain poultry meat. According to the Food and Drug Administration, “[Bologna] may not contain more than 30% fat or no more than 10% water, or a combination of 40% fat and added water. Up to 3.5% non-meat binders and extenders (such as nonfat dry milk, cereal, or dried whole milk) or 2% isolated soy protein may be used, but must be shown in the ingredients statement on the product’s label by its common name.” In all, you can be sure that at least 45.5% of a given bologna is meat. In most other deli meats, the source animal is somewhat apparent through the texture and flavor of the meat (think roast turkey or ham). This is not so for bologna, because the FDA requires that all bologna ingredients be comminuted, or reduced to minute particles so that no lard, collagen, or spices are detectable on the tongue. Essentially, the result of comminution is a “meat batter”  Most bologna producers don’t reveal the particular spice blend they use, but typical pickling spices like black pepper, coriander, and celery seed will most likely be included, as well as myrtle berries. A package labeled “Bologna with Variety Meats” can consist of no less than 15% of raw skeletal muscle meat with raw meat byproducts. Byproducts in this case refer to non-skeletal muscle organs, like heart, kidney, or liver. Bologna of this nature must name the animal species said byproducts were sourced from, and be individually named in the ingredients list. “Mechanically Separated” means that the meat product contains more than 150 milligrams of calcium per 100 grams of product, whereas a product that falls below this threshold can list the ingredient as “pork trimmings” or “ground pork”, for example. Some calcium inevitably joins the meat via machinery that separates meat from bone, with incredible efficiency, called Advanced Meat Recovery (AMR). Bones contain both calcium carbonate and calcium phosphate, so the 150mg calcium maximum is intended to ensure bone particulate and dust are not present in the bologna. Through AMR, the bone is to remain intact while meat is scraped, shaved, or forced off through a sieve at high pressure. Pork and poultry may be processed in this way, but regulations do not permit human food to include mechanically separated beef — a precaution against Bovine Spongiform Encephalopathy, or Mad Cow disease. 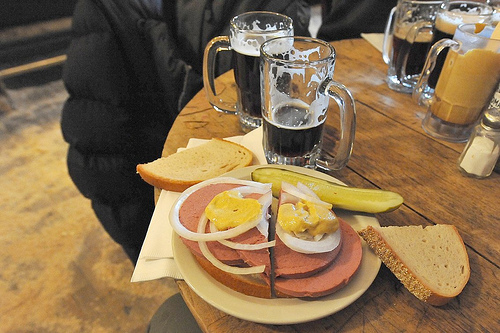 We can sing songs of our bologna’s names, we can contemplate the silliness of its pronunciation, but without some research it is difficult to discuss exactly what bologna is. 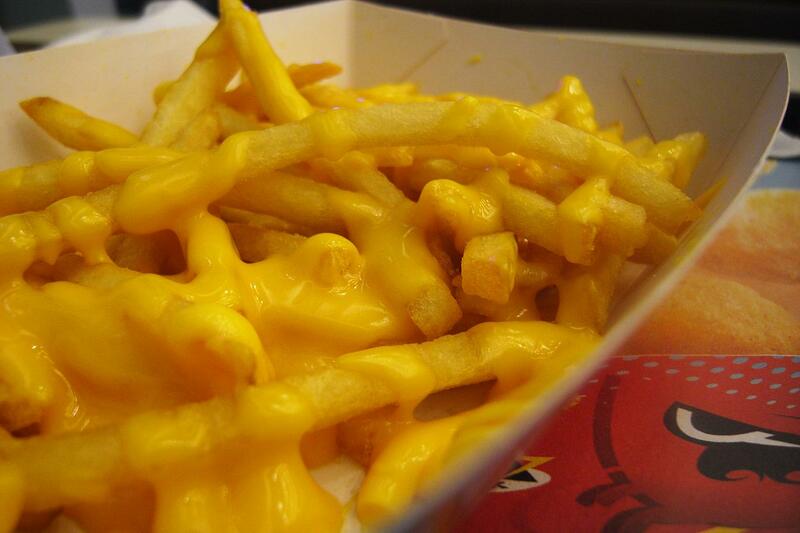 Despite its enigmatic status, I hear it’s quite good when fried. United States. United States Department of Agriculture. Food Safety and Inspection Service. Hot Dogs and Food Safety. Web. 20 Oct. 2015. Aberle, Elton David. 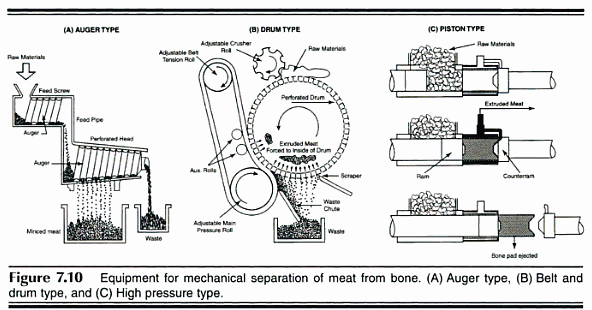 “Principles of Meat Processing.” Principles of Meat Science. 4th ed. Dubuque, IA: Kendall/Hunt, 2001. Nicholson, Myron D. Method of Making a Cellulose Food Casing. Viskase Corporation, Courtaulds Fibres Limited, assignee. Patent US 5277857 A. 11 Jan. 1994. Print. 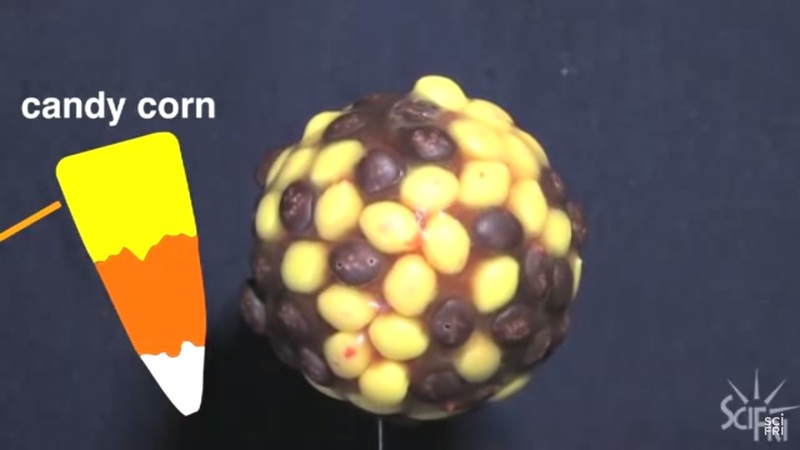 In space, NASA astronaut Don Pettit uses candy corn for a zero-gravity candy corn demonstration that illustrates how surfactant molecules behave. In Germany, Café Gruen Ohr offers customers the chance to customize their own candy using a 3D printer. 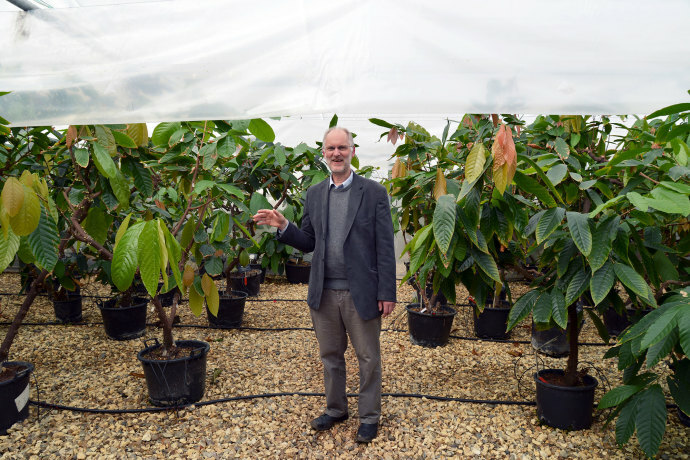 In the town of Reading, located in Berkshire, England, exists the International Cocoa Quarantine Centre, where tropical cacao plants are kept to prevent the spread of pests and diseases which threaten the world’s chocolate supply. Over at Technische Universität München, physicists have shown that molecular simulations can solve how the chocolate-making process turns bitter cacao to sweet, silky chocolate on a molecular level. Is there anything more disappointing than finding a chocolate bar in the back of the desk drawer, anticipating a tasty treat, then unwrapping the bar only to find a dull, grey haze has overtaken your dear candy? Seeing as bloomed chocolate is still edible, yes, there are many things more disappointing than that. But surely you’re curious about how chocolate that was once shiny and perfect came to be filmy and rough. Chocolate blooming, the process that produces the white-grey film that appears on the surface of an old chocolate, is due to molecular migration. More specifically, this imperfection is caused by the movement of fats to the surface of the chocolate followed by a subsequent recrystallization. In a paper published by Applied Materials & Interfaces, a team of researchers dedicated to keeping our chocolates blemish-free has clarified the precise mechanisms that cause chocolate blooming. The main fat in chocolate is cocoa butter, which is solid at room temperature and melts at 37 degrees Celsius. The proportion of solid to liquid cocoa butter depends on the lipid composition, which depends on which specific triglycerides are present. The solid to liquid proportion also varies with the storage conditions of the chocolate. As proposed by Aguilera et al, scientists who study this chocolate blooming, consider chocolate as a particulate medium of fat-coated particles such as cocoa solids, sucrose, and milk powder, all suspended in a fat phase with the aid of an emulsifier, which helps to mix fats and oils with water, which usually repel each other. There are six crystallographic polymorphs of cocoa butter molecules, that is, there are six ways the molecules can organize themselves. The structural stability of these polymorphs increases from 1- 6; form 1 is the best at forming solid butter at room temperature, while form 6 tends to arrange in the loose bonds of a liquid. Form 5 is the main form in chocolate, as it possesses the most aesthetically desirable properties. 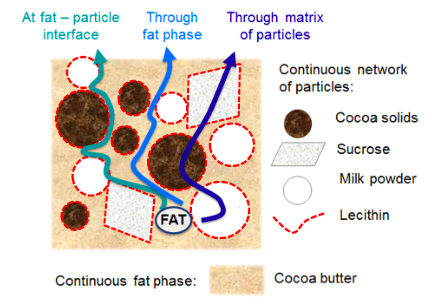 While the phenomenon of blooming is well known to result from melting and recrystallization of chocolate into a less desirable polymorph, it has been unclear how fat moves through the chocolate particle network: Does it move along the fat-particle interface? Does it diffuse through the fat phase (cocoa butter), or through the matrix of assorted particles? In this experiment, researchers used synchrotron microfocus small-angle X-ray scattering to determine the preferential migration pathway of the cocoa butter molecules surrounded by three different soild components (cocoa solids, skim milk, and sucrose). 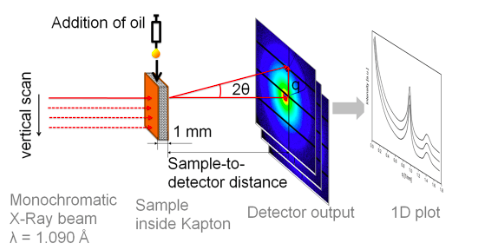 This technique allows researchers to record the scattering of x-rays through a sample with defects in the nanometer range. They can then extrapolate information about the material’s macromolecules, their shapes and sizes up to 125 nanometers, and distances between partially ordered materials, such as pore sizes. For this experiment, this method is better than more traditional macroscopic techniques as the sample does not need to be dissected in order to examine it, therefore the same sample can be continually analyzed. The researchers prepared and tempered four different chocolate samples. An initial scattering of x-rays and data collection was performed before the addition of sunflower oil, then 10 uL of oil was pipetted onto the chocolate surface, and a second scan was performed. Images of the droplet were captured through a high-speed camera. These scans were repeated at 5, 10, and 30 minutes after oil addition, and again after 1, 2, 5, and 24 hours. The results obtained suggest that oil is migrating through pores and cracks in the solid structure driven by capillarity within seconds. This means that the oil can flow in narrow spaces in opposition to gravity. Then chemical migration through the fat phase occurs. The oil doesn’t traverse the fat-particle interface, nor does it move through the matrix of solid particles. This migration disrupts the crystalline cocoa butter, which induces softening. Because the most immediate migration of oils occurs through the material porous structure, the formation of chocolate bloom could be prevented by minimizing pores and defects in the chocolate matrix. To prevent the longer-term effects of chemical migration of lipids, one must minimize the content of non-crystallized liquid cocoa butter. Tempering chocolate lends to crystalline structures that resist migration, as will reducing the liquid fat content. However, to ensure that you never encounter a sad hazy chocolate again, we recommend eating all chocolate goods expeditiously.